Only yesterday, in my review of Westfront 1918 and Kameradschaft, I wrote about my love it or hate it relationship with war or true life stories on film, and what do you know, another one that touches on both comes along a day later. 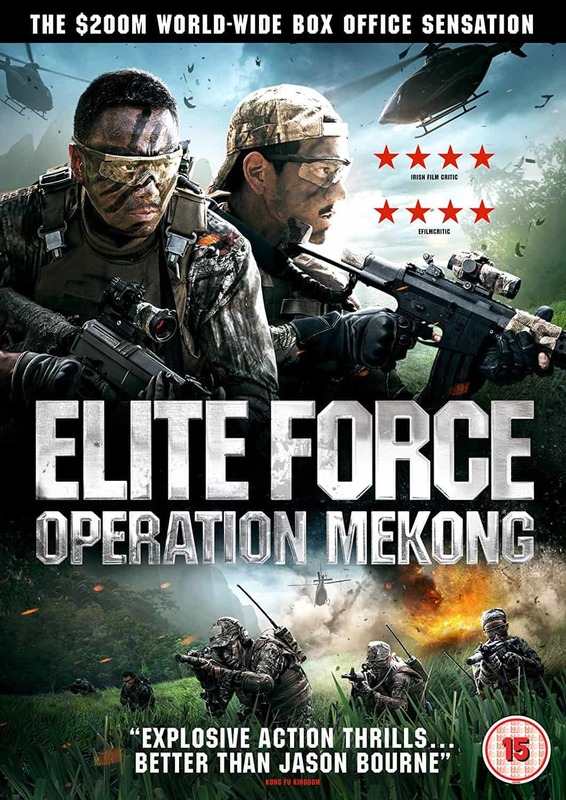 Elite Force: Operation Mekong (a.k.a. 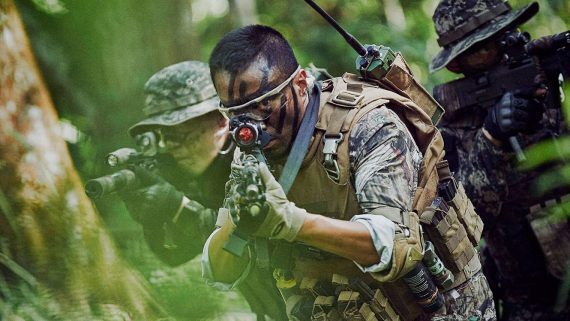 Operation Mekong or to use its original Chinese title, Mei Gong he xing dong), is not a war story as such, but it sees an elite task force battle against a drug baron with so much force it feels like one. It’s based on the actual ‘Mekong River massacre’, which happened in 2011, and the ensuing anti-drug operation that followed. In the tragic event, two merchant ships were attacked on the Mekong River on the borders of Myanmar (Burma) and Thailand, in the Golden Triangle area (a place synonymous with the drugs trade), and the 13 Chinese crew members were murdered. In the film, the crew members are initially suspected of being involved in drug smuggling after 900,000 meth pills are found on the scene. However, an informer tells them otherwise and when the merchants’ bodies are found and they look to have been executed, a special Chinese task force is deployed to investigate and arrest the drug baron suspected of ordering the massacre, Naw Khar (Pawarith Monkolpisit). This is one of those cases I discussed yesterday when it very much feels like the grim reality of the actual events have been amped up and glossed over to make an exciting piece of entertainment, rather than a sensitive or intelligent examination of them. However, I was fully prepared for this after reading a few reviews and knowing the film was being marketed as a balls to the wall action film. As such, I tried to ignore any issues of authenticity or sensitivity and sat down to enjoy some explosive violence, the likes of which Hollywood rarely delivers anymore but Asia has been dishing out for decades. And as an action movie, the film is pretty damn good. 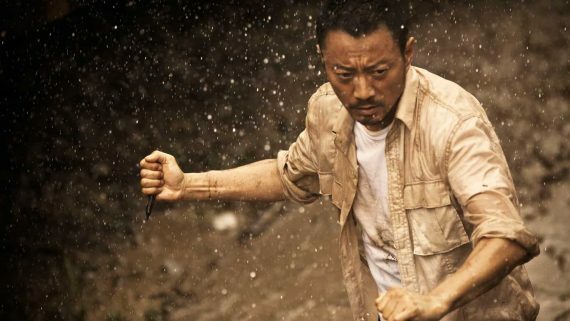 Dante Lam has found great success in the genre over the years (at least in Hong Kong and China) and his experience shows as he delivers a slick and solid slice of big budget entertainment. There’s a decent spread of action throughout the film, with three epic set-pieces setting the foundations. The first of these comes about half an hour in, when the team break an informant out of the clutches of the enemy, ending with an exhilarating car chase. This features an astonishing camera shot which uses some digital enhancement to gracefully swoop around the action, ending inside the barrel of a rocket launcher as it’s fired. There’s a lot of showy camerawork like this, with the huge amount of movement getting a little much after a while. It gives the film style and energy, but occasionally I wanted a rest from it. Similarly, some of the fight scenes suffer from shaky-cam syndrome and over-zealous editing, but I’ve seen worse and it gets away with it. You can usually tell what’s going on and you can still feel the impact of the hits. Speaking of which, the action choreography is very good. It feels brutal and believable, yet still exciting. In general, the action is fantastic. It’s gloriously over the top, which threatens the realism of it all, but if you can get past this fact, there’s a lot of fun to be had. I found the big and brash style, on top of the straight forward men-on-a-mission plot, to be refreshingly old-fashioned. There are some modern effects and gadgets of course, but it had the feel of a late 80s or early 90s action movie, particularly in the finale where we’re treated to some old-school jungle combat, complete with exploding huts and a thrilling speedboat chase. There is a darker, more thought-provoking aspect to the film though. Naw Khar uses child soldiers to do some of his evil deeds, including a shocking embassy bombing. The moral implications of this crop up a couple of times when the task force has to face up against these gun-totting youngsters. Do they take them out as they would an adult because their life is in danger, or do they try to spare them and risk getting killed themselves? It makes for food for thought in an otherwise mindless piece of entertainment. Elsewhere, the film has its fair share of cliches though and the overblown nature can get a bit much at times, particularly given the subject matter. Even the child soldier theme is overdone in certain scenes, such as when they’re laughing and taking hard drugs whilst playing Russian roulette. Overall though, it’s an exhilarating experience that’s bound to win favour amongst those who like their action big and bold. 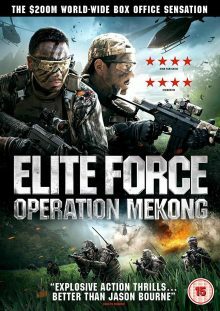 Elite Force: Operation Mekong is out now on VOD and on 17th July on DVD in the UK, released by Cine Asia. I watched a private digital screener so can’t comment on the final picture quality of the DVD, but I imagine the VOD version will be the same and it looked and sounded great. The DVD contains the following special features: making of featurettes, trailer, poster gallery. I didn’t get these to watch, but I’m glad to see some extras added to the package.